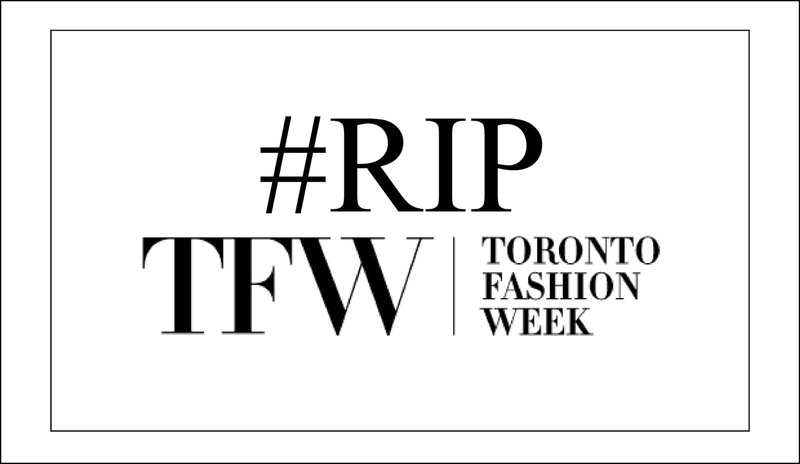 Last Thursday, it was announced that IMG has pulled out of funding for Toronto Fashion Week and thus, TFW organizers have decided to cancel the semi-annual event. This initially came as a shock to me however, I can't say I was sad to see the event come to an end. I feel like us designers, bloggers, and industry insiders have pretty strong opinions on the demise of Toronto Fashion Week, so I would really like to take the time to give my two cents on this news. I feel like at times, Fashion Week in Toronto was more about being "seen" than what was truly important about the show - the clothes. Many have said that the event never felt serious, like a place for business, but it felt more like a nightclub. It became more of a vanity fair for attendees rather than an event celebrating Canadian talent. Overall, the idea of "Fashion Week" doesn't work in our industry anymore. People don't want to wait six months to be able to purchase something. They want it now. So, many designers are now showing fall collections in the fall, and spring collections in the spring. Really, in this day and age, it just makes sense. The Canadian fashion is a small industry and yes, we are consistently growing, but our Fashion Week should reflect that instead of being overshadowed by major corporate sponsorships that do not reflect what fashion in Canada is about. While the fashion industry can certainly be glamorous, at the end of the day, it is a business, and events such as Toronto Fashion Week need to become more retail-friendly and less "social". That's not to say that it wasn't a great event for exposure for designers and models, but from a business point of view, the show always came after a buying season, so to me, it's hard to see what the real benefits for designers was - this is especially true for the small and independent ones. Aside from the ones in Toronto, not many international media outlets were being brought in for Toronto Fashion Week. When you compare it to other Fashion Weeks for example, Fashion Week in Toronto has remained at a stand-still for many seasons now. Other weeks around the world have evolved to include a shop-able element into the runway, which has made the shows more about sales than exposure, and especially for Canada's small fashion market, us designers need to be able to reach the consumers directly. I feel like it is events like what Toronto Fashion Week became that gives the fashion industry a bad rep. There are so many logistical factors at hand, and fashion in Toronto is so much more than parties and expensive clothing. The focus of Toronto Fashion Week moved from what was inside the tents to the street style and events hosted by corporate sponsors, all at the expense of the designers. Overall, I do see why IMG decided to pull out of funding... after all, there is a lack of support from the province and city and the reality is, why would an American company invest in the Canadian fashion industry when it is already so difficult to get Canadians to care about Canadian fashion? I don't believe this is the end for fashion in Toronto at all. For years now there have been so many organizations that truly care about Toronto fashion and the talent that so prevelant in this great city. There is Fashion Art Toronto, Fashion Takes Action... just to name a few. I truly feel like Toronto's fashion community is strong and supportive, and with the end of TFW, designers will no longer be overshadowed by events that don't reflect fashion in Toronto. I have the utmost confidence that the Toronto fashion industry will come together to make the Canadian fashion industry thrive on culture and talent. What were your opinions upon hearing of the end of TFW? I would love to read your thoughts and leave this open for a discussion between industry insiders as well as people outside of the industry.